The definitive text on globalization, this book provides an accessible, jargon-free analysis of how the world economy works and its effects on people and places. Peter Dicken synthesizes the latest ideas and empirical data to blaze a clear path through the thicket of globalization processes and debates. The book highlights the dynamic interactions among transnational corporations, nations, and other key players, and their role in shaping the uneven contours of development. 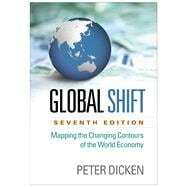 Mapping the changing centers of gravity of the global economy, Dicken presents in-depth case studies of six major industries. Now in full color throughout, the text features 228 figures. Companion websites for students and instructors offer extensive supplemental resources, including author videos, applied case studies with questions, lecture notes with PowerPoint slides, discipline-specific suggested further reading for each chapter, and interactive flashcards. *Every chapter thoroughly revised and updated. *All 228 figures (now in color) are new or redesigned. *Addresses the ongoing fallout from the recent global financial crisis. *Discussions of timely topics: tax avoidance and corporate social responsibility; global problems of unemployment, poverty, and inequality; environmental degradation; the Eurozone crisis; and more. *Enhanced online resources for instructors and students. Peter Dicken, PhD, is Emeritus Professor of Economic Geography in the School of Environment and Development at the University of Manchester, United Kingdom. He has held visiting academic appointments at universities and research institutes in Australia, Canada, China, Hong Kong, Mexico, Singapore, Sweden, and the United States, and lectured in many other countries throughout Europe and Asia. He is an Academician of the Social Sciences, is a recipient of the Victoria Medal of the Royal Geographical Society (with the Institute of British Geographers) and of the Centenary Medal of the Royal Scottish Geographical Society, and holds an Honorary Doctorate from the University of Uppsala, Sweden. 1. What in the World Is Going On? The end of the world as we knew it? ‘The state is dead’ – oh no it isn’t! ‘The best of all possible worlds’?